~ Material:shoe body selection of ultra-light ultra-fine fibers,soles use EVA material, also the soft slipper help protect your feet against hurt. ~ Features: environmentally friendly non-toxic, wear resistance, waterproof, easy to clean, anti-aging, ozone resistance is good,MD sole is of non-slip, elastic and shockproof features. 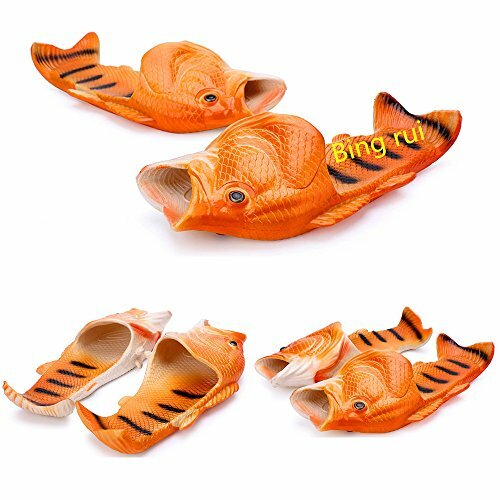 ~ Suitable for:this cute fish slippers also uses as couple's shoes, A good choice for indoor, outdoor ,shower,beach, swimming, walking,supermarket shopping, friends' party and etc. ~ The shoes are cool：these shoes will make you the focus of the crowd, you can also get a lot of chat and fun，Come and have a pair of your own fish shape shoes. If you have any questions about this product by BING RUI CO, contact us by completing and submitting the form below. If you are looking for a specif part number, please include it with your message.